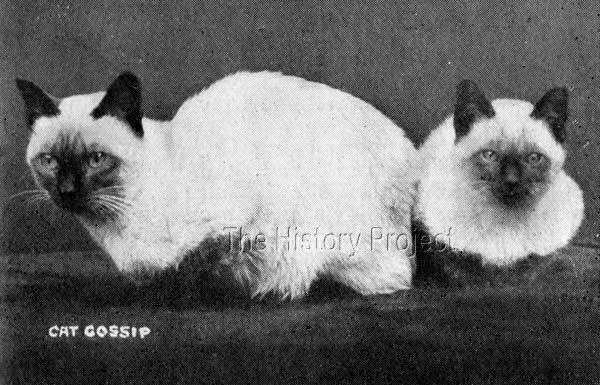 For many decades the story of the arrival of the Gould's 'Pho' and 'Mia' was widely accepted as representative of the foundation of the Siamese breed in Great Britain. But today, we now know that their story was but one of a number of similar importations which occurred between the 1860's and the mid 1880's. 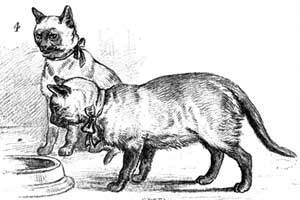 These included the almost concurrent importation of 'Susan' and 'Samuel' by Miss Forestier Walker and her sister Mrs. Vyvyan, as well as the many earlier importations of Siamese cats owned by such notables as Lady Dorothy Nevill and the Duke of Wellington, but also Mr. J. Walter, Mr. Brennand and Mrs. Cunliffee Lee. Later there would be even more imports, such as those to Mr. Elliott Hill in Ireland, and then to Lady Marcus Beresford at Bishopsgate and to Mrs. McLaren Morrison in northern Yorkshire. It is important to always view this history in its original context. Britain was in the heyday of its imperial conquests, with its political and social tentacles extending into Egypt and Abyssinia, into China, India, Burma and in various other parts of South East Asia, from where many of these imports were being sourced. In all of these places, there were a plethora of diplomatic and military appointments, with familial links back to the domestic population in the 'motherland' and very naturally, many fascinating material objects and animals were caught up in a burgeoning trade of curiosities! And this of course, included cats! It is, therefore, not at all surprising that many importations went unrecorded and/or unnoticed by historians and how information regarding them is gleaned often only by delving into private correspondence or memoirs, or into small long forgotten published articles still extant from the period. But the story of the importation of 'Pho' and 'Mia' is none-the-less an important one, as it illustrates the difficulty and dangers associated with organising the shipping of livestock over such long distances, and then, once having obtained the prize, being able to care for and protect the very rare and valuable investment with which you have been entrusted. Mrs. Veley's report however on the importation of 'Pho' and 'Mia' may be relied upon, and these are probably the first verifiable imports of Siamese for which there is a traceable history, involving as it did, both of Miss Gould's brothers; firstly Mr. E.B. Gould, who was for many years Her Majesty's Consul at Bangkok, and then her other brother, Mr. Owen Gould, who was instrumental in bringing both 'Pho' and 'Mia' into England from Bangkok, in 1884. 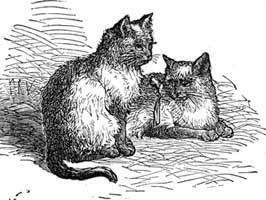 It is interesting to note that despite this being a significant historical event, it is not recorded by Miss Frances Simpson in the chapter on Siamese in The Book of The Cat (1903) published by Cassell; nor is it mentioned by any of the Siamese breeders or contributors to that chapter. This information is most revealing, indicating as it does, that 'Pho' and 'Mia' were only Mrs. Veley's first imported pair, therefore implying that she later imported other pairs, or other Siamese after that date. It also shows, that from her brother the Consul-General, (as a local breeder in Siam), it would have been very possible to obtain further bloodstock. The Consul-General also appears at least, to have been partially responsible for the spread of the breed to a number of locations in and around the east Indian Ocean and possibly into South East Asia and beyond. 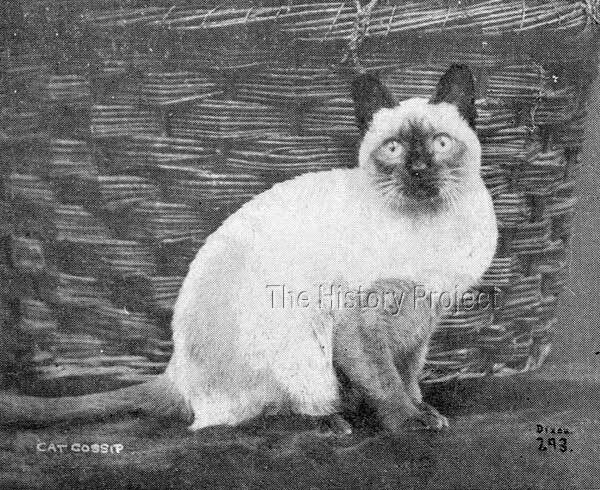 Sadly no photographs have appeared of either of 'Duen Ngai's' parents, but we may now wonder, whether perhaps, they continued to be bred from, producing other litters of Siamese kittens which were not recorded or registered but nevertheless added to the growing gene pool of Siamese cats in England. And if they were not the only pair imported by Mrs. Veley, what other cats did she obtain and where are their progeny? If 'Pho' and 'Mia' usually had four kittens in a litter, were there brothers or sisters to 'Duen Ngai' and to whom were they sold? 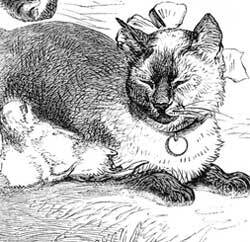 Progeny of 'Pho' and 'Mia', Siamese cats imported from Bangkok, by Mr. Owen Gould, in 1884. All three, by 'Pho' and out of 'Mia' were exhibited at the Crystal Palace Show in 1885. But alas, the triumph was short-lived and a great tragedy was to strike within a week. All three exhibits contracted distemper, and within 7 days all three had succumbed. As their fine portraits will attest, this was a very sad loss to the world of Siamese cats and an unfortunate and very costly reminder that nothing is assured where livestock is concerned, no matter how much care we may think we have taken. 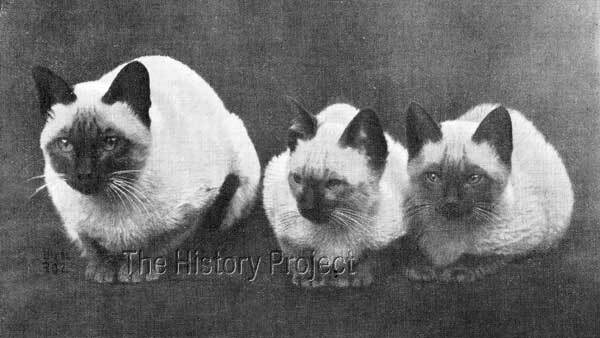 For some time after this, many breeders of Siamese shied away from exhibiting for fear of losing their cats, with only the most proven and hardy of Siamese cats making an appearance. Mrs. Veley's 'DUEN NGAI', by 'Pho' ex 'Mia', born early in 1885. Photo: by Dixon. From Your Cat: Its Care and Treatment, A. de Bary-Saunders/ex Cat Gossip. The above is a remarkable photograph of an equally remarkable cat, and is an image of historical significance. It shows a young cat of approximately seven months of age, in excellent health, with a beautifully clear body colour, with highly desirable contrasting point definition, in a very young exhibit. The appearance is one of vigour and alertness. This image was most likely taken by Dixon at the Crystal Palace Show in 1885. Note that the wicker basket in which the cat was carried is shown as a background. How fortunate we are to have this image of 'Duen Ngai' on the special occasion of his Best Shorthair Cat in Show win, and only seven days before his untimely demise. From the story of 'Duen Ngai' his parents and siblings, we see into a complex world of cat fancying across vast distances. We are transported into Siam, into the cattery of Consul-General Gould and his personal passion for Siamese cats, one which was very obviously shared by both his brother, and sister. "The cult of the Siamese cat has made so much advance since the publication of Vol.1 of 'The Siamese Register' in 1924 that we cannot but welcome with enthusiasm the appearance of a second volume of this most useful work, under the capable editorship of Major E.S. Woodiwiss. The membership of the Siamese Cat Club has risen from 75 to 146, showing the increased appreciation by the public of this beautiful breed." It is still evident from these few words, that the original love she held and nurtured for Siamese since her start with the breed in 1885, remained constant and was clearly apparent, 42 years later when penning this paragraph. Of such is the draw and the appeal of the 'The Siamese Cat'. Your Cat: Its Care and Treatment, by A. de Bary-Saunders. The Illustrated Sporting and Dramatic News, October 1875. The Illustrated Sporting and Dramatic News, October 1879.